Perhaps the most famous slice of lake folklore is the Lady of the Lake in Arthurian legend. So much so that when an 8-year-old girl pulled a sword from Vidostern lake, the internet dubbed her the new Queen of Sweden. The Lady of the Lake of Arthurian legend aside, lakes pop up in a range of tales. And they have more tangible links with belief systems of the past. Archaeologists still find valuable objects like swords in lakes once held sacred by the Celtic people. While we can’t know exactly what our ancestors were thinking, the common assumption is these expensive items became gifts for the gods. Lakes, along with rivers, became portals to the Otherworld. Home to fantastic creatures, they were also dangerous places where the unwary could find themselves caught out. Much of the lake folklore involves bottomless pools, mermaids, vengeful maidens or the Loch Ness Monster. Slavic mythology contains the rusalka. She has a range of origin stories, as most folkloric entities do. Noted folklorist Vladimir Propp noticed the rusalka had benevolent origins before the nineteenth century. These figures emerged from water bodies like lakes during the spring. They helped nurture the crops by ‘watering’ them as they passed. Women might hang “offerings of scarfs and linen on forest trees to appease them” (Ivanits 1992: 75). By the nineteenth century, the rusalka became a dangerous being. More like ghosts than watery creatures like kelpies, people believed rusalki were either young women who’d committed suicide or those who were murdered by drowning. In both cases, runaway bridegrooms, abusive husbands, or feckless lovers were the cause of the watery suicide or murder. The lore doomed the women to live out their days as rusalki until the point when they’d have died, had they lived. Another widespread belief cast the rusalki as “the souls of unbaptized or stillborn babies” as well as drowned women (Ivanits 1992: 75). They continued to haunt lakes and waterways. Most tales painted the rusalki as not being inherently malevolent. If someone avenged her death, she’d die in peace. If not, they’d lure young men into the water where they’d drown them. In this guise, the rusalka bears a remarkable resemblance to both sirens and some incarnations of Jenny Greenteeth. Linda J. Ivanits describes the rusalki as the Russian counterparts to sirens, naiads and other Greek forest spirits (1992: 76). Yet there were differences between northern Russia and southern Russia. In the south, the rusalki boasted youth and beauty. In the north, “the figure tended to be older and unattractive with unnaturally large breasts and long, disheveled hair as its prominent features” (1992: 76). According to Ivanits, the rusalka might take her peasant lover to her palace beneath the water. Alternatively, peasants baptised rusalki to turn them into humans and married them (1992: 76). This one reminds me of the selkies, forced into marriage to humans through the theft of their skins. But you could protect yourself from the rusalki with “[t]he sign of the cross, a magic circle, incense, garlic, wormwood, a pin or poke, and certain verbal charms” (Ivanits 1992: 75). Avoiding strange women who sang to you from lakes was probably a good option, too. We talked a couple of weeks ago about Jenny Greenteeth and the grindylows as water demons living in rivers. And we’ve compared her this week to the rusalka. She does appear in British lake folklore in a few isolated ponds, such as the pond near Trewey Common, or Doxey Pool. For some, “Jenny Greenteeth” refers to the weeds covering the surface. These would certainly pull you to your death if you got tangled in them. Avoiding them is just common sense. 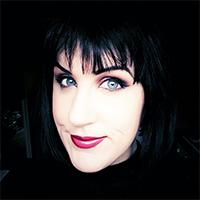 For others, Jenny is a malicious witch who lurks below, ready to strike at any who enter her waters. You’ll find Doxey Pool on the Roaches, the escarpment near the border between Derbyshire and Staffordshire. It’s only 49 x 33 feet. Some legends claim the pond is bottomless. Others say an underground passage links it to the nearby Blake Mere. The lake folklore around these two pools says its inhabitant travels between the two at particular times of the year. But its more famous story concerns Jenny Greenteeth. While many Jenny stories call her a witch, the Doxey Pool variety describes her as a mermaid. A 1949 report describes a strange creature climbing out of the water, believed to be Jenny. One origin story claims a sailor brought the mermaid to the pool after he fell in love with her on a voyage. He died but, being immortal, she didn’t. She grew lonely and bitter because she couldn’t return to the sea. 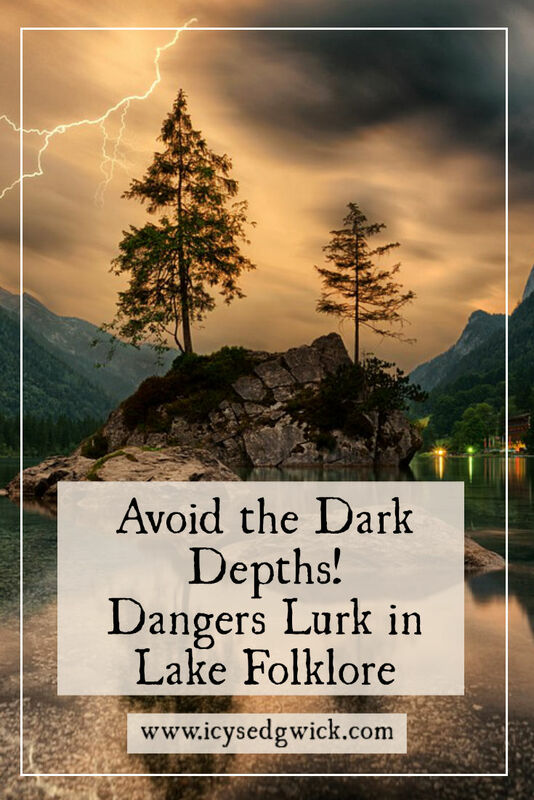 In this version of lake folklore, she haunts the lake to lure the unwary to their deaths. Another story describes Jenny Greenteeth as a local girl who spurned the attention of a local man. He accused her of witchcraft and she was drowned in Blake Mere Pool. She cursed him with her dying breath, and three days later his dead body turned up beside the pool. If you believe this lake folklore, no birds fly over Blake Mere. Dartmoor adds to its weird reputation since it has no natural lakes. Crazywell Pool, on the west of Dartmoor near Cramber Tor, attracted the legend it was bottomless. Locals tried using their church bells as a plumbline to test the depth. They tied the ropes together (giving them over 500 ft of rope) but still couldn’t reach the bottom. In reality, the extreme depth comes from its previous life as a shallow-cast mine. The remains of tin workings lie downhill from the lake. An underground spring feeds the waters. But in 1844, the Plymouth Dock Water Company pumped the pool almost completely dry during a drought. They discovered it was less than 5m deep at the deepest end. Other tales claim the water level rises and falls to match the tides, despite being nowhere near the sea. According to Tim Sandles, the waters announce the name of the next parishioner who will die. If you look into the lake at midnight on Midsummer’s Eve, you’ll see their face. Sandles also relates that one year, two young men heard the tale and considered it rubbish. The locals made a bet that they wouldn’t go up to the lake on Midsummer’s Eve. Not wanting to lose face, the lads went up there on a motorbike. No one knows if they heard or saw anything because they lost control of the bike and died in a crash. Why does lake folklore exist? Much of it explains strange creatures or the dangerous aspect of deep water. Much like river folklore, these legends provide advice for the unwary. While ‘don’t go near the lake because it’s deep’ might not scare someone away, ‘beware the ghost that’ll lure you to your death’ is more likely to ‘stick’. If you enjoyed this post, add your email below and be notified of new articles! Ivanits, Linda J. (1992) Russian Folk Belief, Armonk, New York and London: M.E. Sharpe. Sandles, Tim (2016) ‘Crazywell Pool’, Legendary Dartmoor, http://www.legendarydartmoor.co.uk/crazy_well.htm. Accessed 24 November 2018. Hmmm, wonder if I can visit….